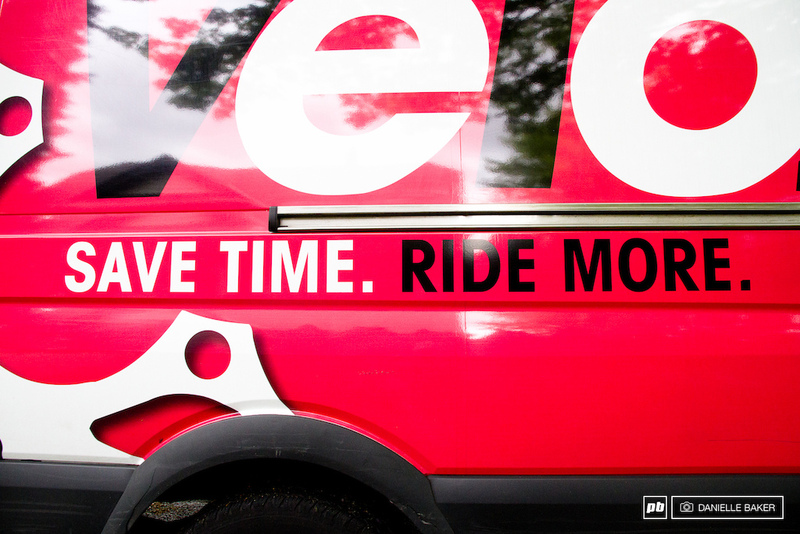 Velofix has based their business plan around the concept of 'save time, ride more'. They offer a mobile bike shop experience that allows you to book your service online and have them come to you, whether it be at your office building or home. Additionally they offer a pick-up/drop-off service for longer repairs or as it suits the client's schedule. Aside from the intricacies of managing a profitable franchise with travel schedules and work orders, it was the hands-on building of the 'shop' that caught my attention. Boris, who initially dreamed up the concept, told me that he spent a week living in the parking lot of a hardware store playing the game of trial and error while he built the prototype. I asked him a few more questions about what it is like to replicate a brick and mortar experience on wheels. Rolo prefers the title Customer Service Manager over Mascot. When it came to making your idea for a mobile bike shop a reality, where did you start? Did you have a vehicle in mind or any specific criteria for finding one? We started in Vancouver, the idea was really born in one of our partner's garages while we were working on a bunch of bikes before the Whistler Fondo. We originally wanted to go with a box truck, like a moving truck, because we figured it would be easier to build out and would give us a lot of space. But then we did some further analysis and realized it was a terrible idea! We didn’t like the economy, the maneuverability or the image that came along with showing up in a box truck so we had to find something more practical and sleek. A family friend gave us a lead on a Mercedes Benz Sprinter and we went to check one out. After building a to scale model we believed that we could make it work and we committed. The Sprinter delivered all the key criteria we wanted: great drivability, best in class fuel economy, cleanest emissions, and best interior room for its size. The vans are designed to provide maximum room and comfort to the mechanics working in them. 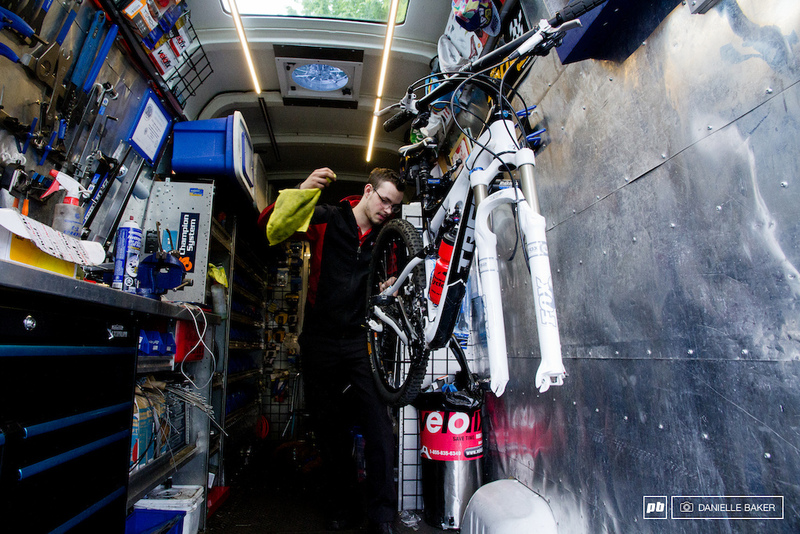 There isn't exactly a 'how to' manual for building a bike shop inside a Sprinter Van, I am sure you had to get inventive, what are some of the more creative solutions you are proud of? 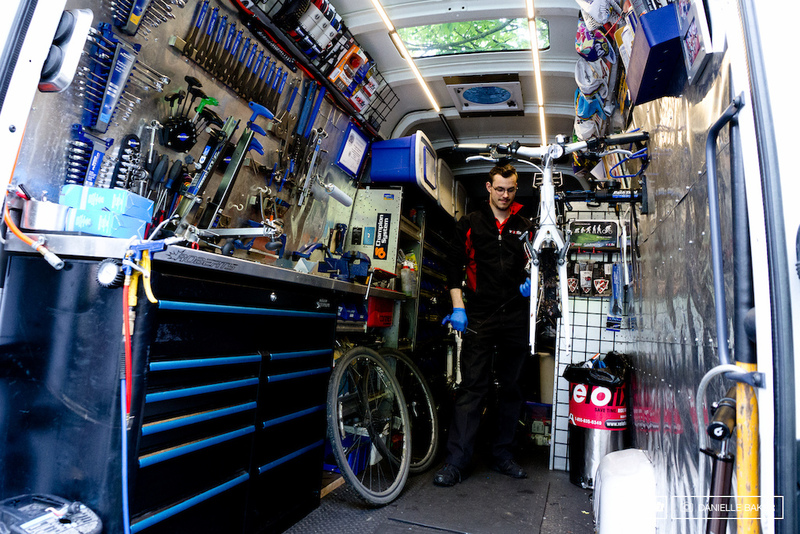 I am proud of managing to fit a real genuine, no-sacrifices made bike shop into the back of a Sprinter. Some clever solutions that we are proud of and that customers regularly notice include full 115 volt household electricity achieved without the use of generators, but with all clean inverted and rechargeable power stations. They are dead quiet, look cool, and deliver power instantly when we want it. The in-counter recessed parts-washing tanks is another, we have a parts-washing tanks with flow through brushes built right into our work benches. The tanks never leak, even while driving, and when operators need to do major tunes and strip drivetrains, they’ve got a place to wash and clean parts right in the truck. The cleaning fluid we use is all eco-friendly and last for months before needing to be replaced. We are proud of our inventory management system. Our onsite success rate for repairs is very high comparatively in the industry. We have worked very hard to build a perpetual 'just in time' inventory management system that insures our franchise owned sprinters always have the parts they need to do a service fully. With our new Sea 2 Sky service van we added a full service built in suspension bench. It was a challenge to figure out how to fit this additional workspace but we knew we had to have it. With a franchise now launching aimed specifically at serving the Shore up to Whistler, we didn’t think we could call ourselves full service until we could fully service suspension too. We are proud to say that now we can! We’ve achieved this by implementing a great workspace and pairing it with our mechanic for the area, Max, who has great technical skills and proficiency in this area. We also have a lot of goodies onboard that include, mobile payments system, television, high speed complimentary Wi-Fi and even an espresso machine. We deliver a true modern bike shop experience. 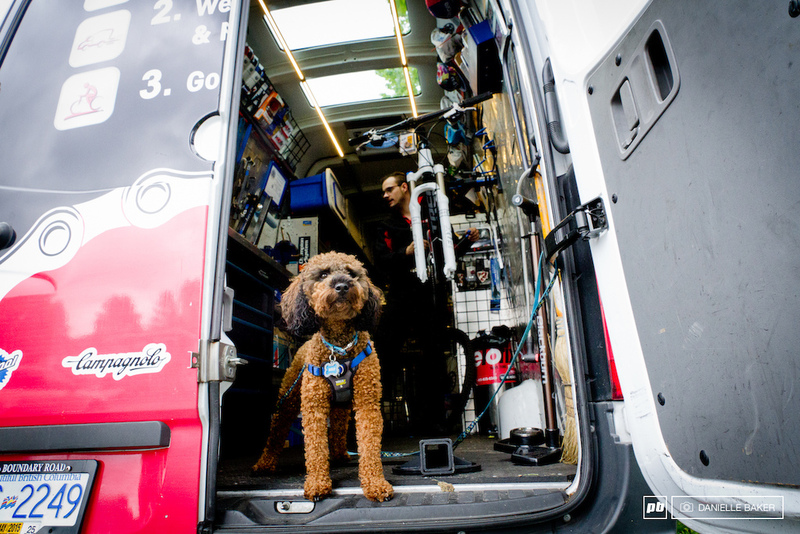 Boris outfitted the pro type VeloFix van by living in a Home Hardware parking long for a week, making multiple trips in and out of the store each time he encountered a new dilemma. Did you miss any important details with the prototype? Were there any 'disasters' the first time you went for a drive/on a call? No, no real disasters. We knew we wouldn’t have all the answers right away so instead of launching live right away we did a friends and family soft launch for a full month to iron out any kinks before going live to the public. Every item in the back of the van is specially secured incase of sharp turns or quick stops. What considerations did you have to account for that are different from your regular bike shop? The fact that the vehicles are moving, parts and tools must stay stationary. We also have to account for work time, invoicing, and travel for each call. This comes down to route optimization and customization per operator to make sure one operator can handle all these responsibilities and stay on schedule. As I already mentioned, there are other things, like making sure the right inventory is onboard and payments can be processed while being mobile. Velofix is now structured as a franchise business and making sure that everyone delivers a great consistent service across the individual owners has many challenges associated as well. Creating in depth operating procedures, getting mechanics certified, training them on all new systems is certainly a lot of work, but we take it very seriously because we really do strive to provide the highest level of customer satisfaction and service possible. Boris gives a client's brakes some love. Boris trues a wheel in the back of the VeloFix van. What are some of the fine tuning additions you have made more recently? We just upgraded our electrical systems to last longer and charge more efficiently, added a custom suspension bench setup to our Sea 2 Sky truck and added a skylight and better venting system for increased operator comfort. Everything the VeloFix vans has been fully customized, including the skylights to keep levels of vitamin D high in their mechanics. What are customers usual reactions to your "shop"? People are really excited about the shop! They love to step inside and take a tour and see how we’ve made it all possible. Customers love all the gadgets and want to share the experience with friends and neighbours, commonly grabbing others close by to show them how we’re working on their bikes. 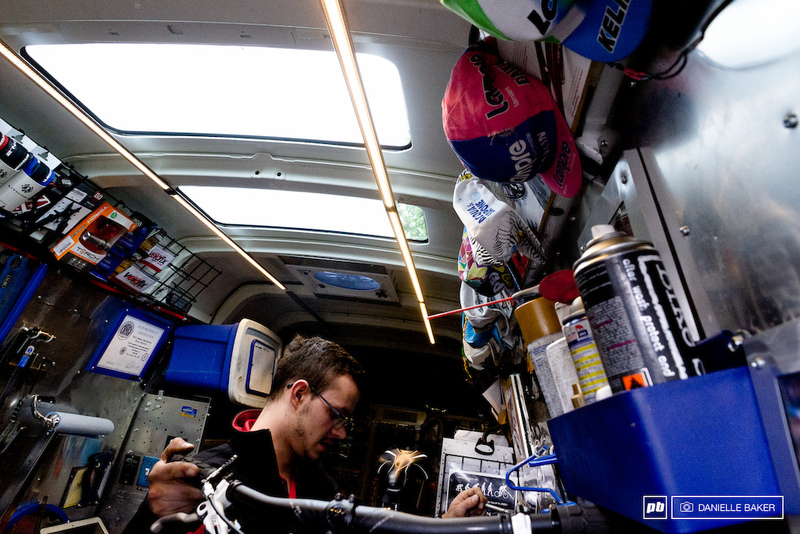 A bike rack near the front of the Sprinter van often houses bikes that require work so that the mechanics always have something to work on between house calls. 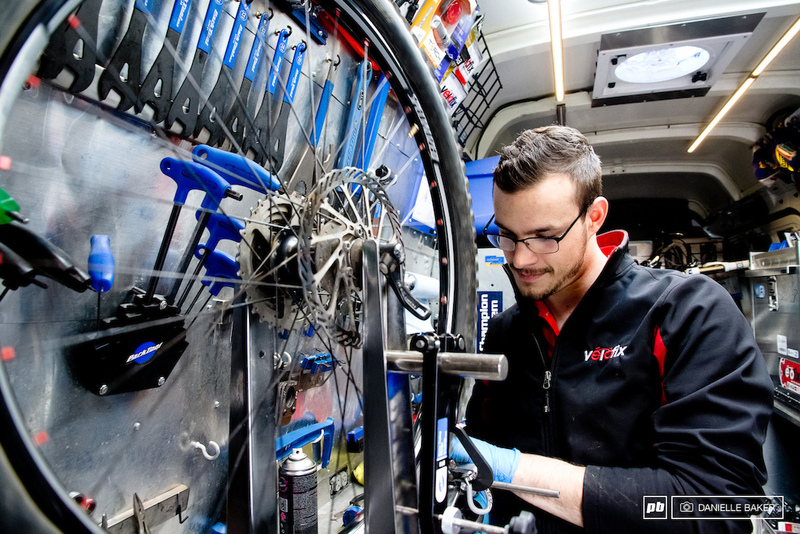 Velofix currently has five vans on the road servicing Vancouver, the Fraser Valley, and the Sea 2 Sky (Burnaby, North Shore, West Van, Squamish and Whistler and Vancouver Island). For more information on the company or to book a service please visit their website. Was that dog wearing a Park harness? If so, I need two! ^ That guy is on a roll! Tried this service out a few weeks ago and it was unbelievable. The way I chose is that they showed up, took the bike and dropped it off a few hours later dialed! Very impressed its an amazing concept. I. want. that. job. Every day your office in a new location, work with bikes of all shapes and sizes, become more familiar with the latest in bike tech and everyday you meet someone who has something in common with you (Except roadies). I just started working with them 3 weeks ago, I am absolutely loving it! Had a friend that turned down an offer to run a truck due to the pay scheme being sketchy. I'm not complaining, nothing out of the ordinary. Already does work in the UK. There's a dude round Surrey who does this, but on the weekends sets up at the top of Box Hill to sort out all the MAMIL's who break their £umpteenthousand 10lb machines when ideally should just stop eating pies. A guy in Boise idaho started a mobile bike service 20 years ago. Cool to see others putting it in place! It says right in the article that it's servicing the Vancouver and Fraser Valley area, not the entire country. Hey Alex, we do also have a location in Victoria, and another one launching in Toronto in the near future. It'll be the whole country soon enough! I fix bikes! In a van! Down by the river! Mobivelo.ca has an awesome set-up. Same online appointment booking and mobile payment. Aside from me they are the only guys that touch my bike. Great service and very reasonable pricing. Plus it's pretty cool to have somebody meet at your convenience to fix your bike... makes you feel like a bit of a pro. It's like the bangbus for my bike! This is often parked up less than 2 blocks from my house. Looks like a professional and useful service. I've often found that my work hours mean that I struggle to get my bike to a shop when they are open so this is great for someone in a similar position! Sweet - nice display of ingenuity. I'd say a cool shop dog should definitely be part of the franchise handbook requirements. Another proof that I was born not where I belong. Lovely Canada! What no picture of the outside of the van in the article? Love the idea. I would be curious how they are able to order parts from say, JBI, QBP, BTI. Alot of parts distributors require a brick and mortar store before allowing a vendor to order. Well done guys, that van really looks good! How do you guys do a full bike wash though? Drivetrain components and other greasy parts can be cleaned in our in bench solvent tanks, and the frame and wheels are polished up with rags and brushes! I do the same here in Rincon Mountain Bike Pro Shop in Puerto Rico for more info you can call me at 787 967-7575 or 787 823-7575 . May as well have a sticker on the back saying, "Loads of really really expensive park tools left in this van every night". All looks just dandy not so sure about truing a wheel with the tyre still inflated though ! Whats up with the different font for the comments? I want to move to Canada! The dog just completes it. Rad van. Got damn, BC is killing it! Always in the forefront! We've had this in Holland since 2007. Pff. Not true, you guys have no bikes, Germans still have them. That's what i called dedication. Lightsaber rack in roof: check.